In a week or two, we will welcome another Babinski Baby! 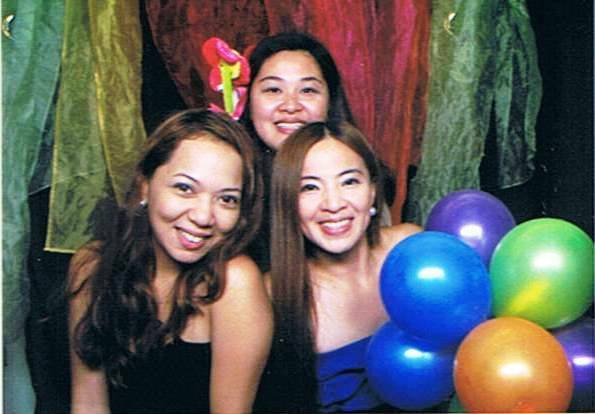 We are all excited coz Babinski Mama Charlene is about to give birth to her 3rd child … another baby girl! =) Aside from her last minute preparations, she is in panic mode …. the baby still doesn’t have a name! Mae and I have been asking her since we found out the gender of the new baby and she would always say “I don’t know yet”. I guess for most of us, naming your baby is just one of the toughest things to decide on even if it were your nth time! When I was in my teens, I already thought of a name for my future baby. But things change (and you don’t end up with the same guy) so when it was finally time for me to decide on what name to give my first born, so many names were entangled in my head! Thanks to the internet, now we can Google baby names… unique baby names… names with meaning – to give us ideas. But seeing all those cool names can make your list too long, that we get confused even more. For one, Charlene wants a name that starts with the letter C. So friends from everywhere gave their suggestions. From the goofy ones like Charing, Chiquitita, Chaparral (haha! Ang daming suggestions kapag kalokohan!) to the beautiful ones like Charlize (mix of Charlene and her mom’s name), Chloe, Chelsea, Callista… and the list goes on and on. It’s really not that easy ‘ya know! There are just so many things to consider, don’t you think? — are you the type who would like to “theme” their kids names (I know of a real family with kids named after holidays). Of course you also have to consider if the name would go well with your family name (remember Andy Lim? Kenneth Sy?). Will it be prone to mispronunciation or to mockery? My former boss was going to interview an applicant with a “kawawa-naman-sha-bakit-ganoon-pinangalan-sa-kanya” kind of name and couldn’t stop laughing right in front of his face (the poor guy said he is used to it). Will the name be nice even when your child turns 50? Does your husband like it? You also have to think of a cool nickname! HAH…the mind-boggling name game! So anyway, Charlene would actually say “I don’t know yet” whenever we ask. But what she REALLY wants is a name that has significance, a name with a special meaning that even her daughter would be happy to embrace for life. When you really think about it, the name you give your child will stay with her forever. Our name even outlives us. So we must choose well. And so I say, be CAREFUL how you name your baby! Ok, it sounds cute and sosyal, but make sure it also has a good positive meaning. That name will be her label, her identity. I wasn’t so conscious about this for my first born, but thank God I was for my 2nd child! We know that in the Bible, one’s name encapsulates its essence or character – be it a person or an animal. The other day, Mae, Charlene and I were discussing the meaning of our names and other friends’ names and parang swak nga. So I’m just reminding each of us to be more conscious of this when naming our children. I don’t really know for sure if it will have an impact on their personality or destiny. But at least your child has a good name to begin her life with. Now who wouldn’t want that? …How wonderful life is while you’re in the world. It was AWCP Bazaar again and the Babinski Mamas were dead tired. You see, when we have bazaars, we don’t have personal service crew and contractors with us. So if our co-bazaristas have scaffolds and high-tech lighting, we have wire-mesh with detachable wheels that we got from Divisoria, our Mecca, and a table lamp with a giant clamp. If our co-bazaristas have a team of three or four men carrying their goods, we have the three of us ladies to carry ours. And that means HEAVY and wa-poise. But then, who cares… we need this exercise once in a while. It keeps our feet on the ground and reminds us to be humble at all times. So while Babinski Mamas Aimee and Charlene were in the booth with mommy customers, I was busy taking pictures of our new polo shirts for boys so I could post it on the website. Believe me, I’ve been attempting to do this for days, but the kids have a built-in sensor that if I am about to work they would ask me to read them a story or cuddle with them under the blanket, which is of course – irresistible. I was taking the pictures in one corner near the a/c, on the cement floor which by the way made the fabrics looked cooler and rugged. No time for studio pictorials for our products, (plus there are two frugal moms in the group, sssshhhh). My Ate, my biggest critic, would tell me to iron the stuff that I post in the site, but I’d always reply with a, “Forget it. My fifteen minutes is rare and precious…” So if you see folds and creases and strands of thread in our photos, blame no one else but me. For this edition’s polo for boys, we choose something funkyish-babyish-boyish-rockstarish. Here comes Jolly Roger! Jabez lost a front tooth again, a total of two front teeth. Gahd! I couldn’t believe a seven year-old boy would be this conscious about his looks. Summer break is really a big relief. Having this humungous babybump is weighing me down and stealing the fun out of me. I’ll be giving birth in a few days! Yahoo! This has been a tiring school year for me. Jabez had lost heart with Reading and Filipino, except for Math, which is a good sign, something that he got from his Dad and definitely not from my side of the family. I sat with him everyday with his books, very patiently (and most of the time, *cough, cough* impatiently. I blame the dude who invented Facebook). It was just so difficult to teach someone who doesn’t show even a .00000892% of interest with the subject! 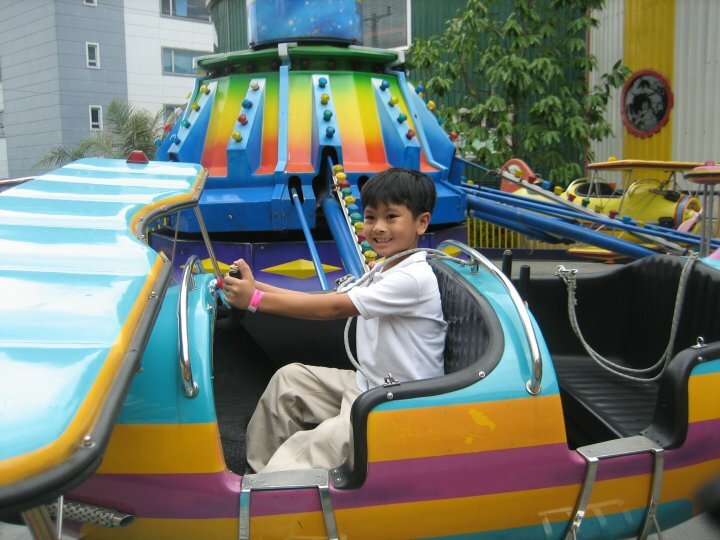 It just discouraged me more when I get called by his teacher for a little heart-to-heart talk on Jabez’ status. Talk about rubbing salt in my wounds. It drove me nuts. I realized that aside from the thousand tasks assigned to moms, being a lifecoach is one of the toughest. There are days when good words come to me like rain in the desert. “You look so handsome with the two new permanent teeth coming out!” “I love you Jabez. For me you are the smartest boy and I believe you can do it…” It calms him down. “I love you, Jabez…” It works more often times than not. It feels weird to be writing here, it’s like transferring to a new home where you feel like you have to start all over again without your familiar resources like the plumber, baker, grocer… So we are still a newbie here and in the process of navigating the site if it is user-friendly, or mommy-with-a-baby-on-one-hand-and-keyboard-on-the-other friendly. 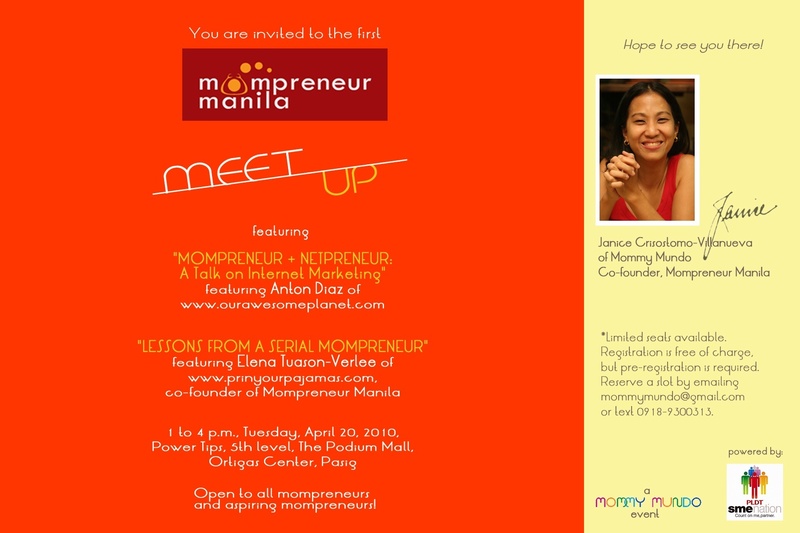 We got an invite from Janice of Mommy Matters for the first Mompreneur Manila Meet-Up. So yesterday, together with our friends Indigo Baby, Pinoy Baby and other mommies, we had a seminar with Mommy Mundo (Mommy Matters) and learned that Mompreneurs would rule in 2011 (!) so don’t underestimate that Mama Bear! Just to sum up the four-hour seminar, as the equation goes, it’s all about: your passion + advocacy + time management = successful mompreneur. And you can do all of it while in your pajamas! There’s money in your passion, yes. But make sure to find your purpose in this world and also what you can give back to the world.